We’d love your help. Let us know what’s wrong with this preview of Between Urban and Wild by Andrea M. Jones. In her calm, carefully reasoned perspective on place, Andrea Jones focuses on the familiar details of country life balanced by the larger responsibilities that come with living outside an urban boundary. Neither an environmental manifesto nor a prodevelopment defense, Between Urban and Wild operates partly on a practical level, partly on a naturalist’s level. Jones reflect In her calm, carefully reasoned perspective on place, Andrea Jones focuses on the familiar details of country life balanced by the larger responsibilities that come with living outside an urban boundary. Neither an environmental manifesto nor a prodevelopment defense, Between Urban and Wild operates partly on a practical level, partly on a naturalist’s level. Jones reflects on life in two homes in the Colorado Rockies, first in Fourmile Canyon in the foothills west of Boulder, then near Cap Rock Ridge in central Colorado. Whether negotiating territory with a mountain lion, balancing her observations of the predatory nature of pygmy owls against her desire to protect a nest of nuthatches, working to reduce her property’s vulnerability to wildfire while staying alert to its inherent risks during fire season, or decoding the distinct personalities of her horses, she advances the tradition of nature writing by acknowledging the effects of sprawl on a beloved landscape. Although not intended as a manual for landowners, Between Urban and Wild nonetheless offers useful and engaging perspectives on the realities of settling and living in a partially wild environment. Throughout her ongoing journey of being home, Jones’s close observations of the land and its native inhabitants are paired with the suggestion that even small landholders can act to protect the health of their properties. Her brief meditations capture and honor the subtleties of the natural world while illuminating the importance of working to safeguard it. To ask other readers questions about Between Urban and Wild, please sign up. This was a beautiful book. Her essays are all very well-written, with some lovely imagery and engaging ideas. She is one of the rare authors truly able to satisfyingly explore a larger idea with a small microcosmic example. She raises many interesting questions and captures the beauty of Colorado very well. The only issue I have with her book is she sometimes seems condescending or supercilious in her opinion of other people. While I'm glad she's able to live such a life, many of us are unable t This was a beautiful book. Her essays are all very well-written, with some lovely imagery and engaging ideas. She is one of the rare authors truly able to satisfyingly explore a larger idea with a small microcosmic example. She raises many interesting questions and captures the beauty of Colorado very well. The only issue I have with her book is she sometimes seems condescending or supercilious in her opinion of other people. While I'm glad she's able to live such a life, many of us are unable to, for any number of reasons. I too have many wonderful childhood (and adulthood) memories of being outside and just exploring nature. But I live in an apartment where I don't have the ability to garden or wander about my undeveloped land. We're not all fortunate enough to be able to live out in the wilderness and be able to afford our own houses/land. We can't all be writers, who can work from just about anywhere these days. One day, I hope to be in her position, but for now, national parks and local parks and forests are the best I can do. 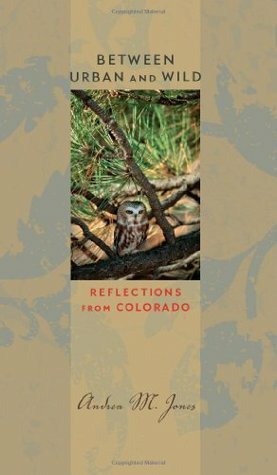 I enjoyed this author's thoughtful reflections of living in Colorado - especially taking into consideration our impact on the land and animals. Her essays on Lake Powell especially resonated with me - as it is also a favorite family vacation for us. Beautifully written with a very balanced view of the importance of protecting nature while living responsibly in wild lands. Andrea M. Jones, born and raised in Colorado, now lives on a grassy ridge in the center of the state. At 8900 feet in elevation, this lovely place invites reflection and is the inspiration for Between Urban and Wild: Reflections from Colorado, a collection of essays on natural history and land use issues. Andrea's work has appeared in Orion Magazine, the Christian Science Monitor, and High Country Andrea M. Jones, born and raised in Colorado, now lives on a grassy ridge in the center of the state. At 8900 feet in elevation, this lovely place invites reflection and is the inspiration for Between Urban and Wild: Reflections from Colorado, a collection of essays on natural history and land use issues. Andrea's work has appeared in Orion Magazine, the Christian Science Monitor, and High Country News, and has been anthologized in Wildbranch: An Anthology of Nature, Environmental, and Place-Based Writing (University of Utah Press, 2011), and in Ankle High and Knee Deep: Women Reflect on Western Rural Life (TwoDot, June 2014). In addition to writing literary nonfiction, Andrea hikes, rides horses, and gardens during the short growing season.